If using Objective-C, include FlurryMessaging.h. if using Swift, no action is required. import Flurry_iOS_SDK includes messaging header file. Auto Integration - With Auto Integration, Flurry handles everything for you. All you have to do is to call the integration API [FlurryMessaging setAutoIntegrationForMessaging]. We’ll receive the notification, convert it to a FlurryMessage, show the notification, handle the notification click, handle the dismissed notification, and handle all the Flurry logging associated with it. Want some customized functionality? You have the option of passing us a delegate to handle any of these steps yourself. Manual Integration - With Manual Integration, your app is responsible for handling the notification receivers and logging events like “Opened” to Flurry. Flurry will check if a notification is sent from Flurry Protal or not. If so, Flurry has receivedRemoteNotification, presentNotification and receivedNotificationResponse three methods to help you organize what to do when a remote Flurry notification is arrived. Flurry will receive the push notification (from APNs) and convert it to a Flurry Message. You may optionally set a listener to get notified when a push is received and opened. This allows you to handle and customize each event as you wish. Flurry will also return a callback , if the delegate is set. Flurry will also return a callback , if the delegate is set. This would be the place to use the deeplink to load the appropriate View. Set token - If you receive a callback that the token has been set, provide Flurry with the token via the setDeviceToken: api. Notification Clicked - When a notification from Flurry is clicked, log this event to Flurry via the receivedNotificationResponse:withCompletionHandler: api. Flurry has reserved the “deeplink” keyword in the app data payload. You may leverage the deeplink string the user enters during campaign set up via the appData property (message.appData). By setting up the proper handling of this string during integration, you will ensure that the user lands on the deep link location after tapping on the notification. Now, when the FlurryMessage is received by the application, you may use appData property (message.appData) to retrieve your custom deeplink String. Be sure to do your null checks, and use the deep link string retrieved to instrument the tap action. 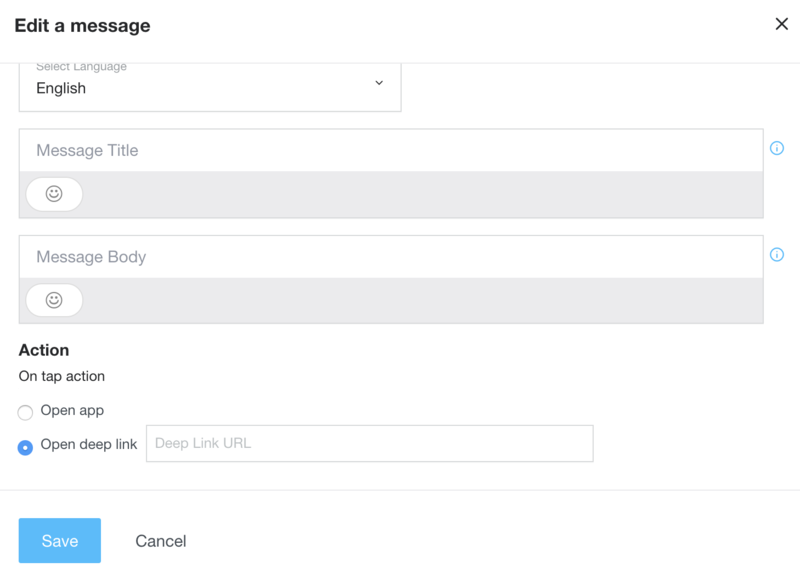 Note: There is another way to implement deep linking using key-value pairs. On the flurry portal, you can add a custom key value pair as: key=article and value=149. On the app side, fetch this key value pair by message.appData[@”article”]. Now the app can download the article with unique identifier “149”, and display that to the user. Code for this use case is shown in the Sample Code section. If you are in auto mode, then you should choose option2 and conform FLurryMessaging delegate method. If you are in manual mode, then you can choose either one option below.